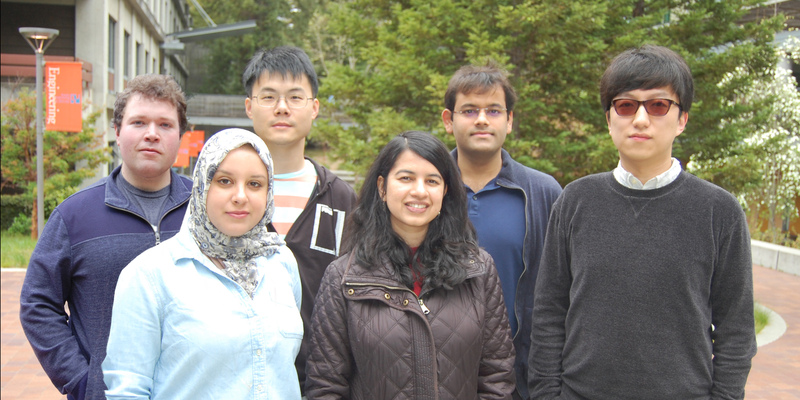 DYF Award Recipients (left to right): Charles Cole, Shereen Oraby, Jude Zhu, Shweta Jain, Rakshit Agrawal, and Huazhe Wang. Dissertation-Year Fellowships (DYFs) are state-funded, merit-based fellowships awarded on a competitive basis to doctoral graduate students who have overcome significant social or educational obstacles to achieve a college education, and whose backgrounds equip them to contribute to intellectual diversity among the graduate student population. The Presidential DYF, based on the academic achievement of the nominee, the potential for success in academia, and the extent the nominee contributes to the diversity among doctoral degree recipients in the division was awarded to Shereen Oraby. Shereen’s research focuses on introducing realistic conversational language style to personal assistants such as Amazon Alexa and Google Assistant by identifying features of creative language styles in naturally occuring data and embedding these features into the input representation of neural generators. As a woman in tech with a diverse upbringing that has included living in the United Arab Emirates and Egypt, as well as the U.S., she is well-equipped to contribute to diversity among the Baskin Engineering graduate student population. The Chancellor’s DYF, based on academic merits, was awarded to Xiangchao “Jude” Zhu. Jude has helped develop technology that would enable an equipment-free medical diagnostic platform for early detection of fatal diseases. This led to the birth of a startup company, NanoSight Diagnostics, which aims to address point-of-care diagnostics of infectious, Alzheimer's, and cancer diseases in a clinical setting and as self-administered tests at home. Charles’ research examines the genes that control the adaptive immune system. His current research project involves sequencing the antibody heavy chain locus: a highly repetitive part of the human genome that has defied previous sequencing efforts. Shweta’s work explores sampling and estimation mechanisms. Due to a recent increase in connectivity amongst people and devices and new advancements in recording and storing data, existing algorithms used for measuring very large networks of interconnected entities have become inapplicable. Shweta is working to address this problem, focusing on applications of algorithmic ideas from theoretical computer science to large-scale data mining problems, especially in network analysis. Rakshit’s research in machine learning, structures, and crowdsourcing focuses on developing and implementing learning models that use the structural nature of the underlying data to predict future content quality. An example of this is his work on structuring contributions on Wikipedia from each user in the form of sequences sorted by time, and building different models that could use these sequences to predict the quality of future contributions from the user. Hauzhe is interested in computer networking topics with a focus on network verification and diagnostics. To address the challenges of errors in network configuration, Huazhe’s research focuses on developing new format techniques to improve the reliability of computer networks.